Regardless, the aloha shirt’s existence can be traced to a confluence of cultural influences. It had a Western-style silhouette (similar to the palaka, a heavy cotton work shirt worn by plantation workers and originally inspired by Western sailor shirts), was cut from Japanese kabe crepe fabric (originally used for women’s kimonos), was made by Japanese and Chinese tailors (who originally immigrated as plantation field workers), and was worn like a Filipino barong tagalog(a beautiful, gossamer dress shirt), always untucked and outside of the pants. “The aloha shirt visually captures the multiethnic history of the place,” explains Linda B. Bradley, professor emerita at Washington State University and author of Aloha Attire: Hawaiian Dress in the Twentieth Century. “It’s a window into Hawaii’s cultural universe.” In the 1920s, Hawaii’s cruise-ship tourists became enamored with the singular garb, and sought local tailor shops for their custom prints and made-to-order shirts. Eventually, the shopkeepers kept ready-made versions in stock so visitors could walk out wearing the brightly colored keepsakes. In tandem with tourism, the word “aloha” was attached to Hawaiian souvenirs and products as a clever marketing ploy. On June 28th, 1935, Musa Shiya, “the Shirtmaker,” ran an ad in The Honolulu Advertiser that read: “Aloha shirts — well tailored, beautiful designs and radiant colors.” In 1936, local businessman Ellery J. Chun trademarked the term “Aloha Shirt,” and the name stuck. By 1941, not even the bombing of Pearl Harbor — when fabric imports, garment exports, and tourism ceased until the end of World War II — could curtail the aloha shirt’s appeal. Many US servicemen brought the brightly patterned rayon shirts back as a badge of honor. (In fact, shirts from this era, deemed “silkies” for their weight and feel, are coveted for their vivid colors and remain some of the most valuable today.) Since Western-imported clothing was scarce, residents embraced aloha attire. And because Hawaiian manufacturers had to print fabric locally, they looked to Hawaii’s flora and fauna for inspiration, creating the island’s signature tropical prints, using block-printing and eventually screen-printing methods. The golden era of the aloha shirt would last from the ’40s through the ’50s, the decade when Hawaii’s tourism soared from 50,000 to 250,000 visitors annually. Tourists and servicemen aside, A-list celebrities popularized the aloha shirt as well. There was Bing Crosby in the 1930s. Hawaiian waterman and Olympian Duke Kahanamoku in the ’50s. Montgomery Clift in 1953’s From Here to Eternity. Elvis in Blue Hawaii in 1961. Presidents Harry Truman and Dwight D. Eisenhower even stepped out in the shirt, increasing its visibility world wide. 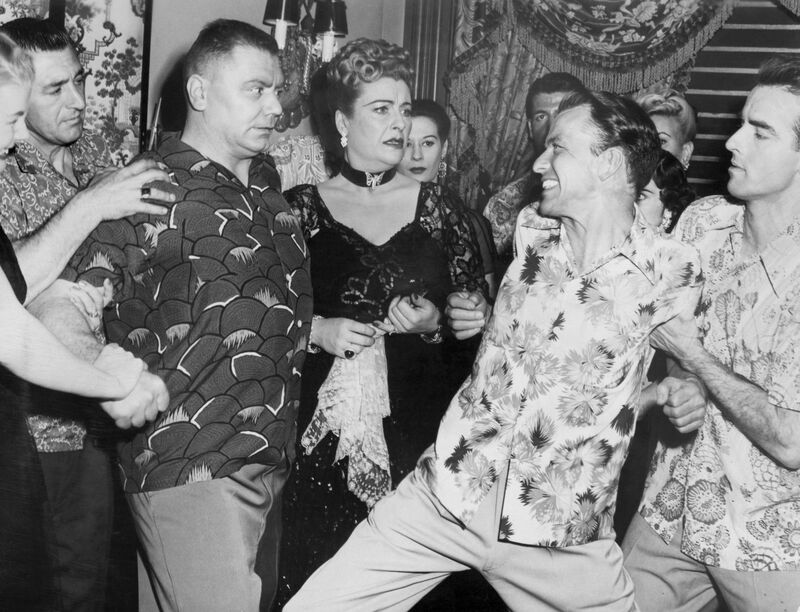 Scene from From Here To Eternity, featuring Ernest Borgnine (third from left), Frank Sinatra (second from right), and Montgomery Clift (right). Mainland manufacturers, wanting in on the profitable aesthetic, starting creating their own Hawaii-inspired apparel. Hawaii’s statehood and the resulting media attention in 1959 only increased its appeal. Then, in the ’60s, California’s surfers returned from the North Shore with aloha shirts and board shorts in tow. Around this time, the wild prints that became famous on the mainland started appearing, as did reverse-print aloha shirts (which have the fabric sewn inside out for a more subdued effect, and remain popular with locals today). 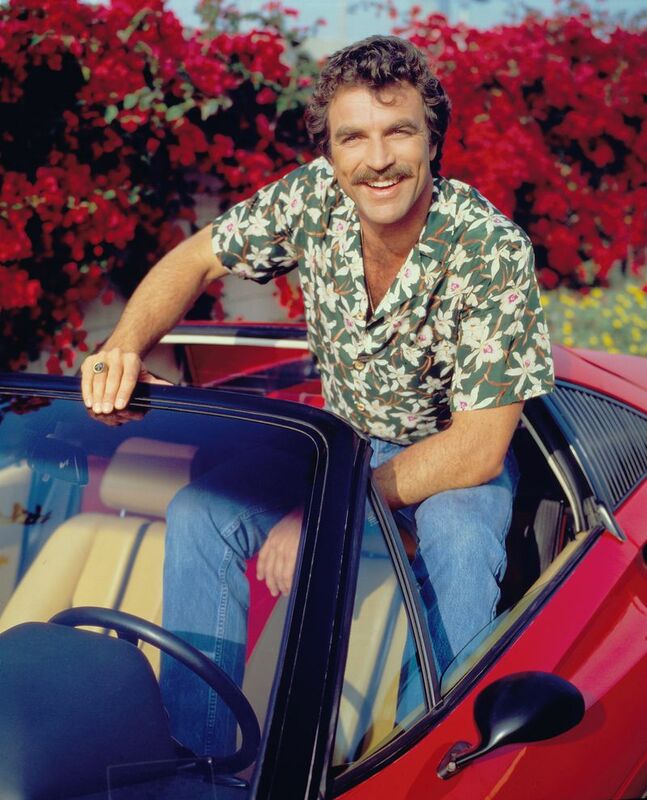 Tom Selleck on Magnum, P.I. Alas, the aloha shirt’s popularity, along with cheap manufacturing, ultimately produced its downfall. By the ’80s and ’90s, Hawaiian manufacturers struggled to compete with offshore production, and big-box stores like Costco and Walmart stocked cheap renditions from abroad. These shirts, found across America and in Hawaii itself, blatantly cribbed designs from other brands and used miserable synthetics like nylon and polyester, further ruining the garment’s reputation. Model at a Roberto Verino show in Spain, 2013. Like everything else in fashion, the aloha shirt’s appeal is cyclical, but its popularity is strongly tied to Hawaii’s allure as a whole. The ’40s and ’50s were Hawaii’s tourist heyday; the 1959 push for statehood only bolstered its international image. In recent years, Hawaii has had a renewed cultural renaissance. In 2013, the Hōkūle‘a, a traditional Polynesian voyaging canoe, launched its latest worldwide voyage. In 2017, GQ declared Honolulu “Hawaii’s Suddenly Cool Capital,” and today, demand for poke runs rampant from coast to coast. Hawaii is now a hip, modern paradise. No longer wonder the aloha shirt is suddenly in vogue again. Hope, a former owner of Kahala Sportswear, is less prescriptive. “I don’t think there are any rules to the aloha shirt,” he says. Local shirt maker Sig Zane, who still prints and sews most of his designs in state, says, “You can’t blame outside designers for always hitting up Hawaii, because we’re that paradise and dream state.” He notes, however, that his designs are intentional and channel the Hawaiian hula dressing ceremony mentality, where the mana, or divine power, of the item worn infuses with the wearer’s energy. 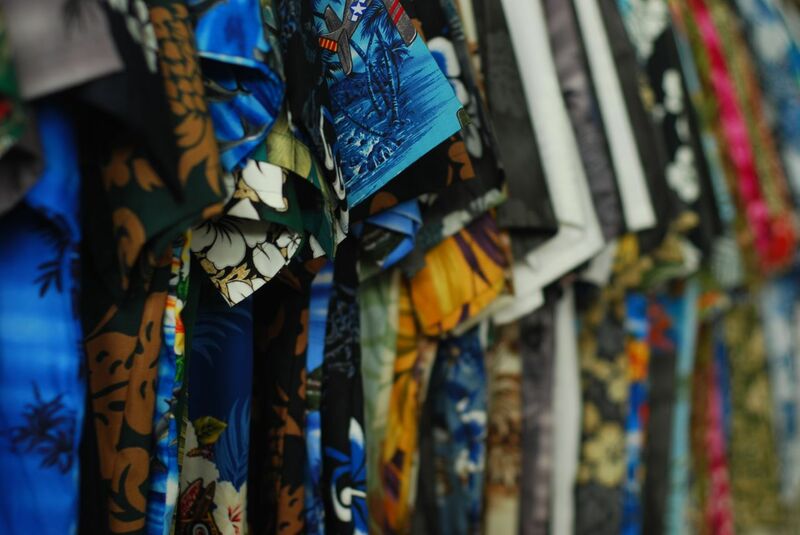 Whatever your thoughts, when an aloha shirt is created without consideration of its place or its past, and simply pursues the latest trends, what’s lost through the garment’s appropriation is the respect and recognition for its cultural origins, all in the name of fashion.